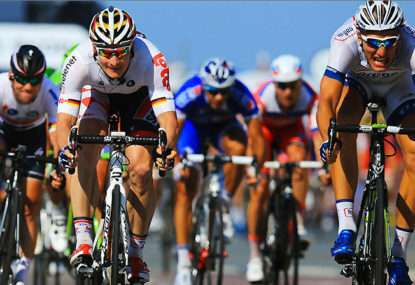 Marcel Kittel and Andre Greipel are among the riders in contention on Stage 7 of the Tour de France. (Image: Team Sky). The last week of the Tour starts from the finishing town of Stage 15, Le Puy-en-Velay, with a 165-kilometre stage finishing with an expected sprint finish in the town of Romans-sur-Isere. However, with two classified climbs inside the first half of the stage, it will not be simple for riders like Marcel Kittel and Andre Griepel in getting to the final sprint. The first climb is the Category 3 Cote de Boussoulet (4.5 km at 6.3%), which is completed after 20 kilometre. While the categorised section of the climb is a little under five kilometres in length, looking at the race profile, the road rises over 600 metres before the summit. A few lumps and bumps come after the descent, before the fourth category climb of the Col du Rouvey (2.8 km at 5.6%). After yesterday’s rest day, I wouldn’t be surprised to see some of the pure sprinters get dropped on those initial climbs. It is then a long descent of around 60 kilometres before the intermediate sprint point in the town of Chatemerle-les-Bles with just under 45 kilometres to go. The final 40 kilometres are on flat roads, before a technical final kilometre, with a fast right then left hand 90-degree sequence of corners leading onto the final straight with around 500 metres to go. Can Kittel make it six, or will the likes of Griepel and Alexander Kristoff show up to the party? Join The Roar’s live coverage of Stage 16 of the Tour de France from 10pm (AEST).